This section commonly applies to the modification of password for database or any folder or item. The following image shows you a window used to set the password. If you attempt to change an already existing password, there will be also a text box for current password. 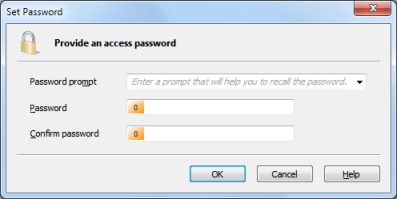 Enter in the Prompt text box any hint that can help you to recall the password in case you forget it. Never enter a prompt that can help unauthorized person to guess your password. Prompt should be useful, but only for you! For example, if your dog is a Labrador and you enter breed of your dog as a password, then typing the prompt "Breed of my dog" in principle completely excludes the sense of protection because your password will be extremely easy to guess. Enter a new password in both Password and Confirm Password text boxes. Click here to learn how to create a strong password. If the element (database, folder or item) already has the password set, you will also be asked to type the current password in Current password text box.